The tweet included a picture of a massive pyramid in a snow covered landscape. According to the story, Aldrin deleted the tweet after a few hours. Making a picture like this is fairly easy. I used Bryce, a landscape generator, to create the landscape. I took care to use several terrain objects at varying distances from the camera, in order to give the picture a bit of depth. I did not add any mist, because the environment is a bit cold for that. I added two people to the landscape for a couple of reasons. One was to indicate scale. Another was to give viewers someone in the picture to empathize with, to feel a sense of wonder, slightly tinged with fear of the unknown. There is nothing overtly scary in the picture of course. I did not want it to be. The fear and horror comes later, when the people are trapped inside the pyramid with...something. Perhaps one of the beings that built the pyramid, perhaps something else. Something that killed them, and has been laying dormant in the frozen waste since then. Aaah, back to technique: I didn't have cold weather clothing for the characters, but because they are seen from a great distance, all I needed was bulky clothing, or, as I just happened to have...a spacesuit. If you enlarge the image, you may be able to see that the characters are wearing spacesuits. I composited the pictures in Affinity Photo. 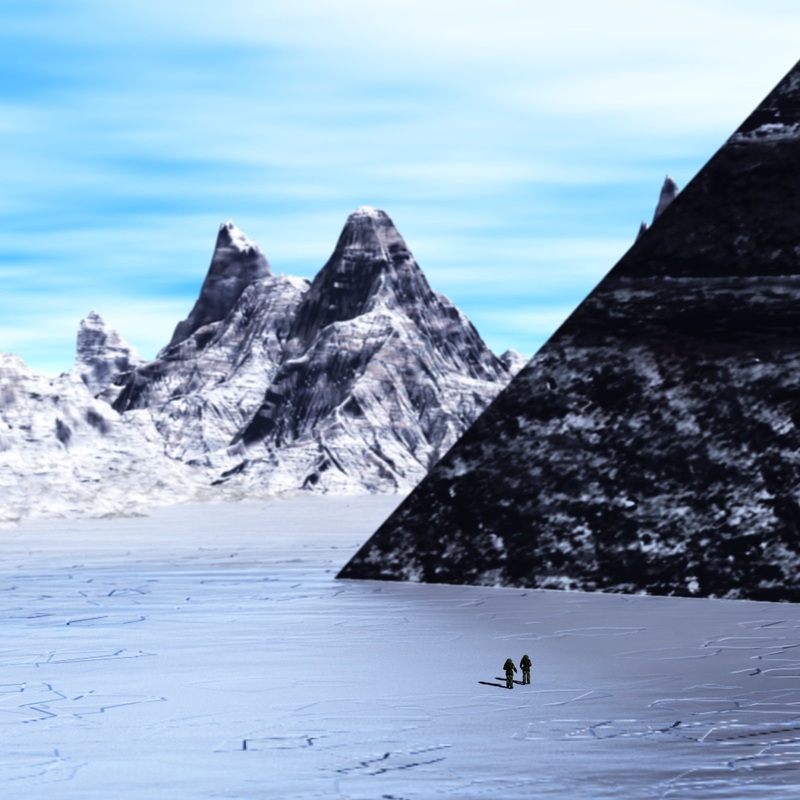 I wasn't happy with the texture I used for the pyramid - there was no snow, so I painted the snow on. I used a paint brush to give the snow a little bit of structure, and sampled the color from the snow on the ground. 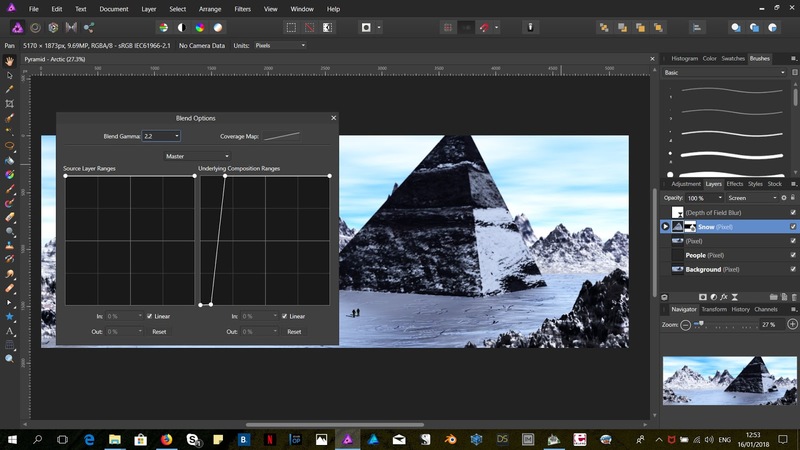 One noteworthy point: I painted the snow on a separate snow layer, and I used Affinity Photo's Blend Range function to ensure that the snow would stick only to the brighter parts of the pyramid. This made it look as if snow and frost had stuck to some parts, and been blown away by the wind in other parts. The snow looked a bit dark, so I flipped the blend mode to Screen. More Dark Pyramid pictures? I don't know. For now, it's just this one. I have another project I am working on with a few friends, and I want to focus on that.